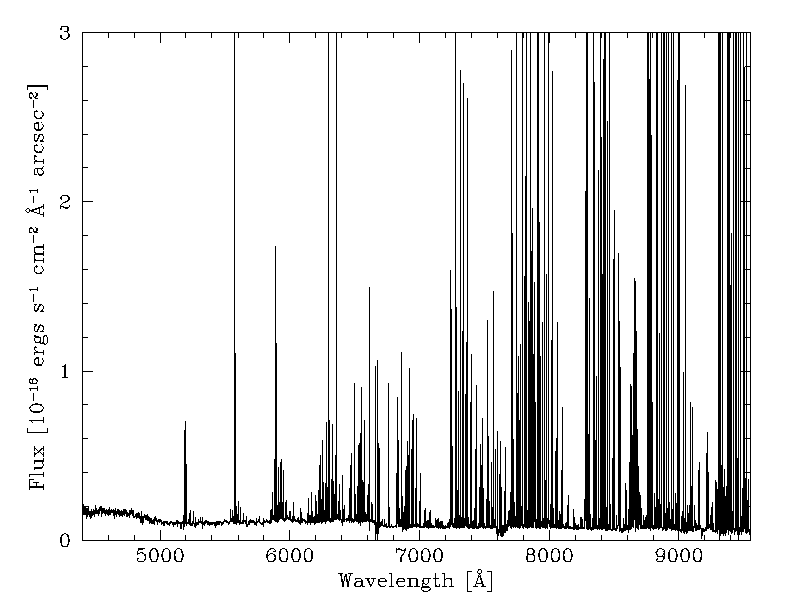 Spectrum of the sky at visible wavelengths from the UVES high resolution echelle spectograph on the VLT in northern Chile. This PHP calculator, designed by Michael Bergamo, allows the observer to calculate the S/N, exposure time, point source flux or surface brightness for a given observing setup. The calculator outputs the user-selected value as well as the transmission percentage, transmission FWHM, notable emission lines, and an image of the sky spectrum at nearby wavelengths. Observers should ensure that all of their planned observations have at least 25% transmission at the redshifted wavelength. point source and surface brightness calculations, respectively. The above algorithm was taken from the IRAF "ccdtime" task. For further help see the IRAF "ccdtime" help page. The sky spectrum and OH line list were provided by the UVES sky emission atlas and Philippe Rousselot, respectively. The lunar contribution to the background is considerably larger with the MMTF in the beam, most likely due to large amounts of scattered light off the surfaces of the MMTF etalon. For very bright moon conditions, the scattered is sometimes highly asymmetric with respect to the optical axis. The calculator accounts for the increased brightness using an empirical relation derived from measurements at ~6800Å. Note that this assumes a uniform brightness increase and does not account for the observed asymmetry in the scattered light. We strongly encourage observers to apply for grey or dark time to avoid such issues.